Good Choice Reading: TQOTD - What was Your Favorite Berenstain Bears Book? TQOTD - What was Your Favorite Berenstain Bears Book? 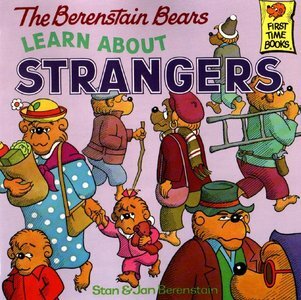 On Friday, February 24th, Jan Berenstain, co-author of the Berenstain Bears books passed away at the age of 88. Together with her husband, Stan, the pair created one of the most successful empires in children's literature - featuring books, videos and TV shows about the everyday problems of a family of bears. The books were first published 50 years ago, and have since had some 300 titles and 260 million copies sold. Now that both "Mama" and "Papa" Berenstain have passed away, their son Mike will continue to run the family enterprise with his brother. Nineteen new Berenstain books will be published this year. LET ME KNOW YOUR THOUGHTS?? I cant pick one. 1. Because I have bad memory and 2. Because theres so many. But I remember reading their books as a little girl. That and Curious George books. WOW my memory is horrible! I can't remember any right now. And I was just reading some at my job before they closed down in January. This is bad lol. I read them to my kids on a regular basis, from the collection I have from when I was a kid. They love them too, and they prefer them over the newer books of the Dora/Sponge Bob variety. Mine was Too Much Junk Food! Learn About Strangers left the biggest impression on me as a child, but honestly, I remember liking all of the stories. Which is a big deal for me because I am not a big fan of stories that anthropomorphize animals.